5.2 B.2 Engaging communities: theories and tools for public participation. 7.1 D.1 The craft of a participatory design process. This page gives an overview of the learning and teaching resources that have been developed within the framework of the LED ERASMUS+ project. All materials from this page can be used by educators who wish to introduce landscape democracy into their courses. The materials are also open to any learner for self-study. The LED course will be offered annually in spring time, the next course will start in March 2019. 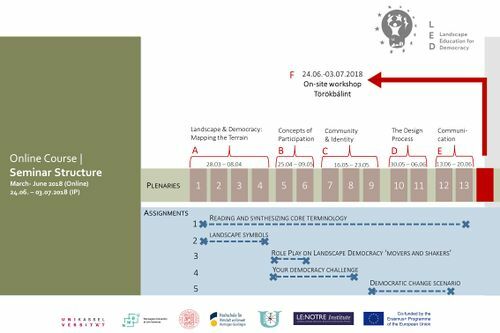 For teachers wishing to adopt the LED methodology and the instructional design of the LED programme, we recommend you reading the LED Process Report (Output 3), in particular chapter 3 Landscape Education for Democracy: Methods and Methodology by Deni Ruggeri and Ellen Fetzer. The instructional design is based on the Learning Objectives of the LED programme. If you wish to participate next time please contact us via info(at)led-project.org or join us on Facebook. The LED Reading List gives an overview of relevant literature supporting the theories and methods introduced in the LED programme. We have tried to make as many links as possible to open access documents. However, not all of these materials can be published via the LED project, since they come from other authors and publishers. But all of them can be found in university libraries. The LED Concept Maps are a sort of a democratic and interrelated glossary of the LED course. The terms and concepts have been derived iteratively by synthesizing the discussions of our seminar participants. The concepts have then been translated into a concept map depicting the realtionship of landscape and democracy. Language versions haven then been created from the original English concept map. The LED course uses both formative and summative assessment forms. Formative assessment was done by the group tutors who were guiding the teams through the assignments. The course includes four group presentations during which the teams presented their findings and assignment results. These were intensively discussed during online sessions by a team of evaluators together with the seminar tutors. Evaluation criteria have been published as part of the assignment descriptions. An evaluation from was completed iteratively after each assignment step and send out as direct feedback to the seminar groups after each presentation. The finally completed form was used for generating and overall grade for each team/participants. The evaluation form can be downloaded here. Groups will present their findings from the photovoice/landscape symbols exercise. Recapitulation part A and introduction to part B. Thematic input: What is community design? An exploration of different understandings of the concept of participation. Interactive discussion: Group discussion and identifying landscape democracy challenges. Assignment 3 'Role Play on Landscape Democracy "movers and shakers" ' starts. Assignment 4 'Your Landscape Democracy Challenge' starts. B.2 Engaging communities: theories and tools for public participation. Information on seminar sequence and upcoming steps. Role play 'movers and shakers' in virtual roundtables. Recapitulation part B and introduction to part C.
Instructions for upcoming group presentation. Groups present assignment 4 'Your Landscape Democracy Challenge'. Information on seminar sequence and next steps. D.1 The craft of a participatory design process. Recapitulation part C and introduction to part D.
Interactive discussion: Community design processes. Assignment 5 'Your Democratic Change Process' starts. Interactive discussion: Group discussion on the topic. This page was last modified on 30 October 2018, at 09:17.